We have a dessert potluck (I know – how fun is that!) to attend this weekend so I wanted to make something that would be easy for people to pick up and eat. Cupcakes are always yummy and simple to transport. This is a new recipe I experimented with after successfully using root beer to make cupcakes a month or so ago. 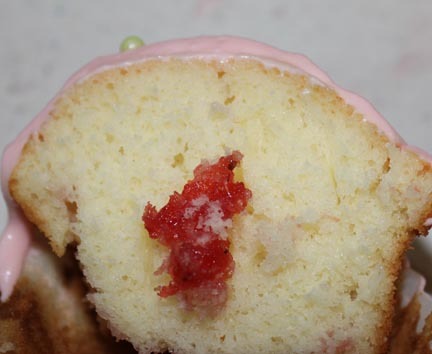 The cupcakes have a surprise dollop of strawberry jam inside while the frosting – oh, my, the frosting – it has strawberry flavoring and a liberally dose of strawberry pop. Make the cake mix according to package directions. Fill paper-lined muffin cups about 3/4 of the way full of the cake batter. 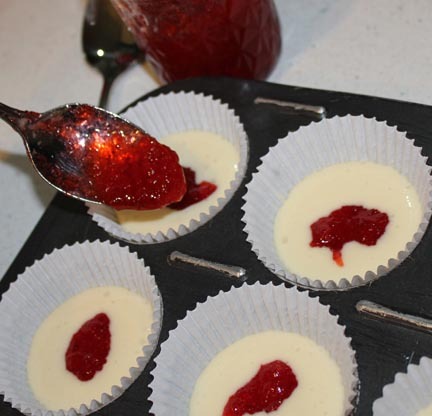 Drop about 1/2 teaspoon of jam into each cupcake center. 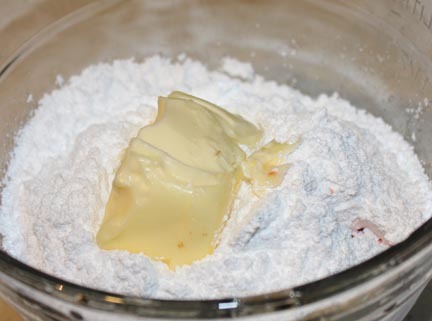 If you don’t have enough batter in the cup, the jam will sink to the bottom. Top with batter and slide into preheated oven to bake. 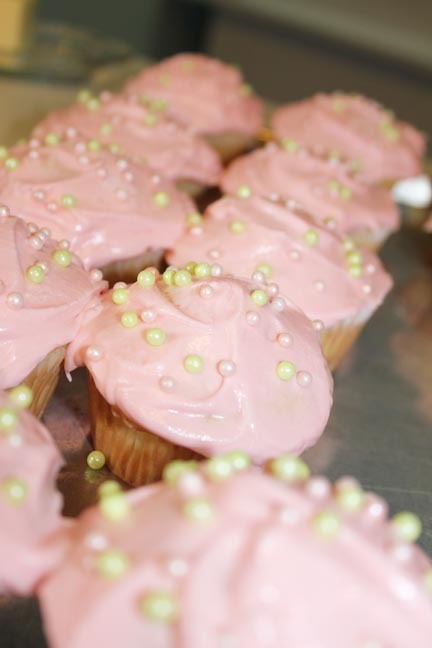 While the cupcakes are baking until they are a light golden brown (about 15-18 minutes), mix up your frosting. You can add some festive sprinkles to the top if you so desire. Take a bite and enjoy the sweet, strawberry surprise in the middle! 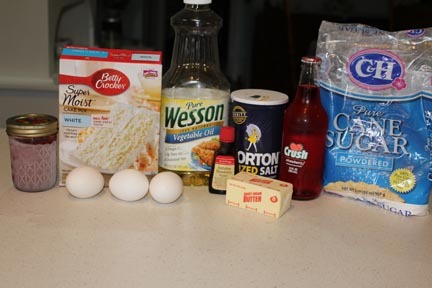 Mix the cake mix with eggs, oil and water until smooth. 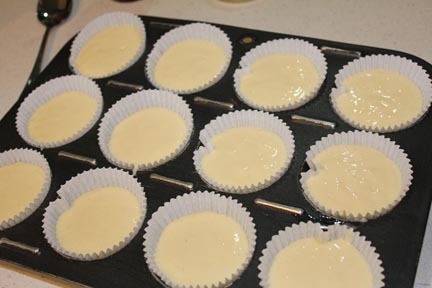 Line the cups of a muffin pan with papers and fill each cup about 3/4 of the way full. Spoon about 1/2 tsp of jam into each cup. If you don’t get enough batter in the cup, the jam will sink to the bottom. Pour more batter over the top and bake until a light golden brown, about 15 minutes. For the frosting, mix powdered sugar with softened butter, salt, flavoring and soda pop. You can add more flavoring if you want a stronger strawberry flavor. 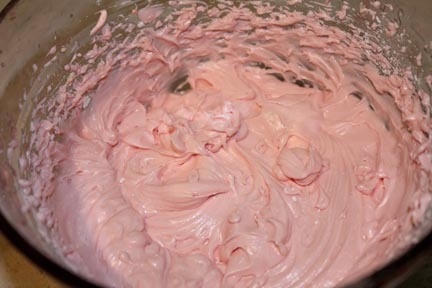 The frosting will be a pretty shade of pink. 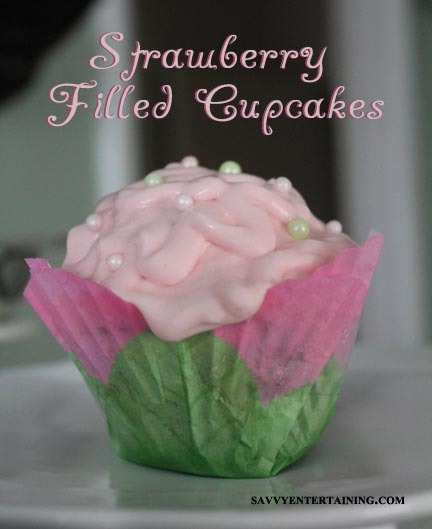 Accent with your favorite sprinkles or fresh strawberries. If at all possible, act pathetic and pressed for time so the big manly man of your house will help put the sprinkles on. Strawberry is one of my favorite flavors! Looks so pretty and yummy! Hope you have a wonderful Labor Day!!!! !